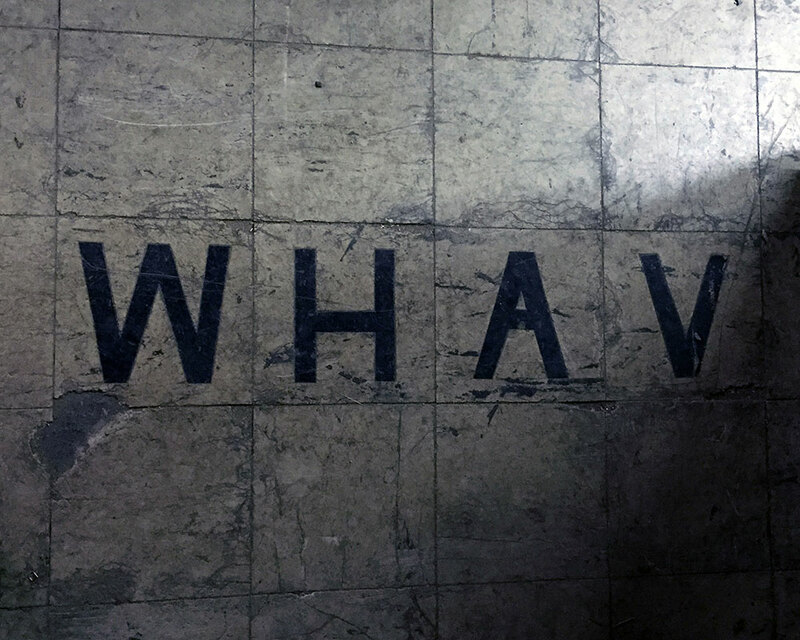 WHAV’s call letters were embedded in the floor when the Silver Hill transmitter site was dedicated in 1947. You know WHAV as your local FM station at 97.9, but those letters on radio have meant many things to different people over nearly 100 years. In fact, the letters haven’t always been associated with Haverhill and haven’t always even been on land. Broadcasters thanked listeners for sending in reception reports by mailing them a stamp with the station's call letters on it. The call letters WHAV first graced the airwaves Aug. 14, 1922. From 6 to 7:45 p.m., the Wilmington Electrical Specialty Company sent out its first scheduled broadcast, at about 1000 kHz (300 meters) on today’s dial, as a final equipment test. It included a broadcast of the latest Victor records, news, live music and a saxophone solo, followed by classical piano and violin and finally arias from classic operas by a soprano. The broadcast signed off with local sports scores and the weather report. The 100-watt station began commercial operations at a frequency of about 1128 kHz. The Wilmington Electrical Specialty Company was founded around 1918 by three radio enthusiasts, who after a decade of searching for needed parts for their hobby, decided to start a small business on the side providing hard-to-locate radio parts for the few radio devotees of the region. When radio took off in popularity, so did the company. It first became a national distributor of parts and then branched off into tabletop radios. The company was a major retailer of radio consoles when commercial radio station began broadcasting. As was the procedure at the time, the radio division of the Department of Commerce assigned the call letters sequentially. The Wilmington Electrical Specialty Company became the proud owners of the call letters WHAV. Technically, WHAV had been broadcasting test signals as soon as their license was granted on July 22. The tests at 1128 on the AM dial received responses from as far away as 100 miles. Now, WHAV was ready to join the growing list of radio stations broadcasting to the public and became the first radio station in the state of Delaware. Radio News noted that in nine months, the number of commercially licenses stations had gone from one (KDKA in Pittsburgh was the first) to 451, with 47 of the 48 states now home to at least one station. The last holdout, Wyoming, would not be home to a station until 1930 when KDFN began broadcasting. WHAV was eventually allowed to boost its power to 500 watts and expand its broadcast area. The government began allowing stations to pick their own call letters and, in June 1925, WHAV became WDEL, far more appropriate for Delaware’s only radio station. Today, WDEL continues to broadcast at 1150 AM operating at 5,000 watts owned and operated by the Delmarva Broadcasting Company, which operates 11 radio stations in Maryland and Delaware. 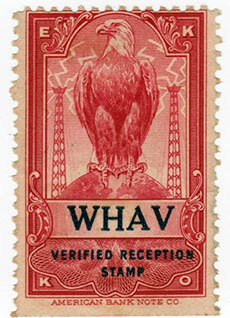 When WHAV became WDEL, in 1925, the call sign may have been abandoned as a commercial radio station’s identification, but the WHAV letters would continue to travel the airwaves. Haverford College in Pennsylvania used the call letters, WHAV, for its AM “carrier current” station, beginning in the fall of 1942. In this style of broadcasting, instead of an antenna, the signal is fed from the transmitter output directly into the school’s electrical system. This allowed Haverford to broadcast only on campus. Legal under Federal Communications Commission rules (FCC had replaced Federal Radio Commission in 1934, which had replaced the Commerce Department as radio’s regulator in 1927), it did not require licensing. As long as the college only broadcast on its own property, it did not need a license and merely adopted the WHAV call letters, as opposed to having them assigned by the government. Haverford College was no stranger to radio. In 1923, Haverford was licensed to launch WABQ and built studios and a transmitting tower on campus. The station was an unqualified success, with the 1924 Haverford yearbook noting that the radio station was garnering more press than all of the athletic teams. The next year, the station went to 1,000 watts of power, making it the most powerful collegiate station in the U.S. and the second most powerful signal in Pennsylvania. The success was short-lived for the students when, in December 1926, the college sold the station and equipment to Keystone Broadcasting Group, who moved the studio to Philadelphia and changed the call letters to WFAN. As a consolation to the students, the “Haverford Radio Hour” became a regular feature on WFAN. In Radio’s Hidden Voice (2009), author Hugh Richard Slotten notes the limited space on the dial made it financially viable for commercial interests to buy out college stations and discourage new college radio startups that would be competing for the listeners. He further notes that in the early 1930s, the FRC stopped treating noncommercial radio stations differently than commercial operations, resulting in a number of college radio stations being forced off the air when forced to upgrade equipment to meet technical requirements, expand operating hours, or switch frequencies. Haverford avoided all of this by using carrier current broadcasting which limited WHAV to only campus-wide reception. For six years, WHAV continued to be the voice of Haverford College, until it too became a victim of its own success. In 1946, Haverford’s WHAV joined Bryn Mawr (WBMC), University of Pennsylvania (WXPN), and Swarthmore (WSRN) to create an intercollegiate broadcasting system. The subsequent press brought these colleges’ carrier current stations to a wider audience, including the FCC. The FCC had two issues with WHAV. First, FCC testing had discovered that the carrier current transmission was bleeding off campus and required the station to update equipment or shut down entirely. The second issue was more a request. The FCC informed Haverford that there was a federally licensed operation using the WHAV call letters, and would appreciate if the call letters could be changed to avoid confusion. The station went off the air in the summer of 1946. The equipment was upgraded and the station signed back on the air as WHRC; the call letters representing Haverford Radio Club, a nod to the college club that first started WABQ in 1923. 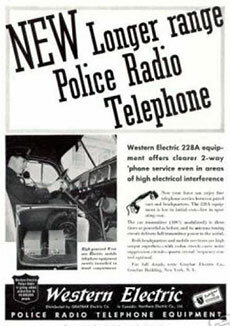 A trade advertisement for police radio equipment made by Western Electric. The licensed operation that had FCC-assigned call letters WHAV was the Haverhill Police Department. And while there was no overlap in transmission between police communications in northeastern Massachusetts and collegiate programming in Pennsylvania, the potential remained for confusion. In the aftermath of the Great Flood of 1936, Haverhill’s communication system was damaged. The most serious concern was the destruction of the underground cables that connected public fire alarm boxes and police call boxes to city hall, leaving the public with no way to report a fire, and patrolmen with no way to contact headquarters. In response, the Boston Police Department sent support to the beleaguered town in the form of two-way radios using the new 30 megacycle band. Boston had purchased the technology from General Electric only two years earlier. A pair of patrol cars established communication between the cars and police and fire headquarters as they patrolled the city for a week after flood waters subsided. The advantages of having radio communication between squad cars and headquarters did not go unnoticed. The New England Hurricane of 1938 again damaged the communication system infrastructure, and this was finally the catalyst. In 1939, Haverhill Police began using two-way radios in their squad cars, but within the old police band just above the then-standard AM broadcast band. The department was granted the WHAV call letters. Early two-way police radio was hampered by the unexpected popularity of the tool in law enforcement. In 1930, the FRC assigned only eight radio frequencies for all police departments in America. The system was inefficient and grew progressively worse as additional police departments across the county added radios to their patrol cars. Early on, police required two frequencies—one for transmitting and one for receiving. Later the “push-to-talk” system allowed one frequency to be used. In 1933, Bayonne, N.J., introduced a new type of police radio using the VHF (Very High Frequency) 30 megacycle radio band. Developed by amateur radioman and Bayonne Police Lt. Vincent J. Doyle and radio engineering legend Frank Gunther, it reduced crowding on the airwaves. As the 1930s turned into the 1940s, VHF band communication became the preferred choice for police departments until finally, in 1949, the FCC declared all police radio should use the VHF band and ended the four-letter call. Moreover, the police radio industry switched from AM technology to FM. Today, Haverhill Police uses the call KCA865 at 155.01 MHz. 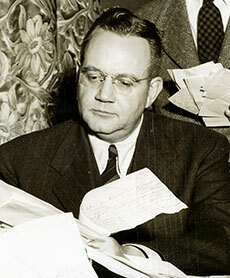 WHAV founder John T. Russ. John T. “Jack” Russ, upon becoming the publisher of the Haverhill Gazette in 1939, found he owned a newspaper that was covering the war in Europe even as it was locked in a more local battle for advertising revenue with the Lawrence Eagle-Tribune. The Lawrence paper, then owned by the Hildreth & Rogers Co., launched a new weapon. On Dec. 19, 1937, WLAW (680 AM) signed on the air. It began at 1,000 watts and reached Boston, Haverhill and the New Hampshire seacoast. WLAW’s studios were at the newspaper offices on Essex Street in Lawrence and the transmitter was in Andover. Just before the war, it increased power to 5,000 watts. Russ knew that if Haverhill merchants could reach a wider audience by buying Lawrence media, the Gazette needed to start a local station to keep pace. The entry of the United States into World War II in 1941 put all plans on hold as the government restricted manufacturing, including civilian radio parts and transmitters. By the end of 1944, it was evident that the Allies were on the verge of winning the war. Russ began to quietly resurrect his plans for a radio station—preferring the new FM system over AM—in Haverhill. However, the Eagle-Tribune was also making plans to expand its radio presence. They contacted Haverhill Mayor Albert W. Glynn about possibly by constructing a second WLAW studio in Haverhill. Glynn immediately contacted Russ. The Haverhill Gazette had no choice to tip its hand and announce their plans for a Haverhill FM station, WHGF (W Haverhill Gazette FM). This original plan, like these call letters, would not last long. The problem was his FM plans had been delayed by a legal war between Maj. Edwin Howard Armstrong, the father of FM and RCA’s David Sarnoff over the very existence of FM radio. In January 1945, RCA convinced the FCC to move FM up to a higher range of frequencies and to give television the vacated frequencies for expansion. This meant any radios owned by the public no longer could access FM, and there was no way for new equipment to be engineered and manufactured quickly enough to cash in on the spike in the radio markets after the war. Russ made the decision to go with an AM station as a stop-gap measure. Getting a station up and running to counter WLAW was tantamount. He assured the public the FM radio station plans were delayed, not abandoned. However, an AM station named WHGF would make no sense. Russ knew the police bands were changing to the higher frequency, making the call letters obsolete in the immediate future, so he contacted Police Chief Henry J. Lynch to discuss options of how and if the Gazette could gain control of WHAV when the police abandoned it. The chief agreed, and the police and the Gazette would essentially swap call letters. The new station would use WHAV and the police would use WHGF for the brief interim until they no longer needed any call letters. WHAV AM officially signed on March 16, 1947. WHAV-FM signed on April 14, 1948. Whether it was because the older radios couldn’t pick up the new FM bands, or because autos only had AM radios, or just that WHAVAM had that 13-month head start, FM simply wasn’t catching on with the public. Russ struggled to make FM work but gave up after five years. In 1953, WHAV-FM went off the air and its transmitter was sold to WCRB. Edward I. Cetlin and Henry R. and Morris Silver, bought WHAV from the Russ family in 1954, and in 1959 decided to try FM as well. FM was by no means yet a strong medium, but it was beginning to show promise. In the meanwhile, FM would simulcast WHAVAM. In 1967, FCC changed the rules and required FM to provide original programming. Cetlin subscribed a pre-recorded tape format of “beautiful music.” Tapes had to be changed every three hours, but employees on the AM radio side were assigned this chore, eliminating a need for additional staffing. Cetlin sold the station in 1980. The WHAV-FM call letters were dropped by the new owner in 1983 and the FM broadcast became WLYT “Lite 92.5” with a light rock format. In 1995, WLYT became the current station WXRV, “The River,” eventually licensed to Andover with an adult album alternative playlist. In 1995, WHAV AM was sold to Eastern Media of Methuen which became Costa-Eagle Radio Ventures Ltd. when the owners of the Eagle-Tribune bought into the company. On March 6, 1995, Costa-Eagle changed WHAV into a Spanish-language format. It was still WHAV by call letters but was no longer the Haverhill radio station envisioned by Russ. WHAV AM continued to broadcast as “Radio Impacto” until Sept. 8, 2002, when WCCM moved to the WHAV 1490 frequency. The WHAV call was out at sea for a few years. Tim Coco, a former news reporter at WHAV, and always a fan of radio, tolerated the lack of local radio as long as he could. In 2004, WHAV signed on again as an internet radio station, simulcasting on Haverhill and other cable channels and broadcasting on AM at such low power that FCC licensing and call letters were not required. Coco did acquire both a Massachusetts service mark for the WHAV name in 2004 and Federal trademark protection in 2008. Those protections, however, had no connection to the FCC, who had control of WHAV as radio call letters. In 2008, as Coco was finalizing his trademark paperwork, the FCC granted the “abandoned” call letters WHAV to the U.S. Coast Guard, which in turn assigned it to the newly launched 414-foot barge Penn 91, built by Corn Island Shipyard of Grandview, Ind., for Penn Maritime of Stamford, Conn., part of an “articulated tug and barge unit” with the tugboat Skipjack, also built in 2008 by Thoma-Sea Boat Builders of Lockport, Louisiana. In 2011, Coco moved the WHAV trademark and operations into a new, nonprofit corporation—Public Media of New England Inc. As the station fine-tuned its broadcast, Coco watched the WHAV call letters. 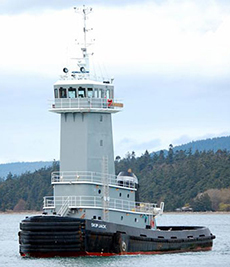 In 2012, Kirby Corporation of Houston, Texas, the nation’s largest tank barge operator, acquired Penn Maritime, who had their own list of assigned radio call letters. Accordingly, Kirby turned the WHAV designation back over to the Coast Guard. By this time, Coco was in the long, painful, and expensive process of getting the radio station back on FM. For obvious reasons, he had always wanted the WHAV call letters for Haverhill's new radio station. He saw his chance. Upon inquiring about the Coast Guard releasing them back to the FCC where Coco could have them assigned to Haverhill’s forthcoming FM station, the Coast Guard dismissed the idea, noting that they could hold abandoned call letters for up to 10 years. Coco was not about to accept such a dismissal. Several calls to local Congressional representatives, Kirby Corporation and the Coast Guard, Coco found himself the with the call letter assignment of WHAV. WHAV signed on at FM 97.9 on Sept. 21, 2016. After 14 years, WHAV was back in Haverhill.